Open the door to the minds of the best technical minds in trading. Developed by Chuck Lebeau and Terence Tan, this trend following strategy trades only markets in which a strong trend has been established. By combining the ADX and RSI indicators to establish the trend, this bond system is an excellent example of a trend following system. The Dollar Trender strategy is a simple US Dollar daily trading strategy that enters a long position based on the 18/50 moving average crossover, and short on the 50/18 moving average crossover. Volatility stops are used to exit long positions, a momentum crossover to exit short positions, as well as some of the old standards to enable as you see fit. This intraday S&P strategy is one of the most complex strategies in the entire library collection. For long positions the current price must have crossed above the first bars high value, retraced back down through it, and then crossed above it a second time. For short positions the current price must have crossed above the first 30 minute bars high (by a certain number of points), and then retraced back below it. Numerous exits are available within this strategy, including dollar stops, end of day exits, breakeven stops and more. This daily bond strategy enters the market long when the market closes no higher than 15 ticks above the low of the day. 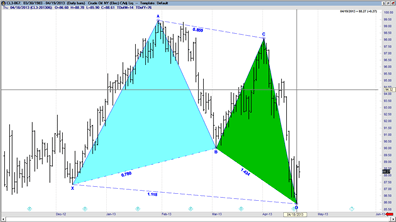 Fond of Bonds uses the standard dollar profit target and dollar stop loss exits. This intraday S&P strategy waits for the RSI to cross up into its overbought zone with a divergence in price and an ADX rising confirmation to enter the market long. The short entry uses opposite conditions. The exits are a standard opening profit limit, and standard dollar stop loss. Short AMA (Long 50) is a short only strategy, meaning that there are no long positions taken. The strategy will sell short when the current close crosses under the Adaptive Moving Average (AMA), using decreasing momentum values for confirmation. Exits include a “length limit” exit (limits the length of the trade), and a standard dollar profit target. Another Chuck Lebeau creation, this daily strategy looks to enter long at the current high when there is a decreasing ADX and an RSI dipping below 45. The sidewinder takes short positions when there is a decreasing ADX and an RSI rising at the current low price. This trend following long-only strategy takes advantage of a great TradeSense® function called Keltner Custom Bands, which can “band” any indicator, price or mathematical function. This strategy takes long positions when the AMA crosses up through its Keltner Custom Band. 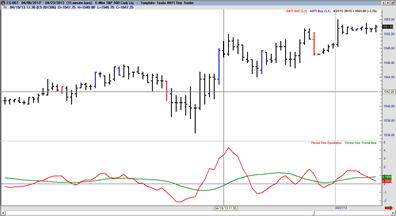 Exits within this strategy include an RSI direction change exit, highest high exit, and a simple profitable exit with a confirming RSI signal. This is a daily stock strategy that trades based on the two bar breakout conditions outlined in Active Trader Magazine. The strategy takes a long position at the high plus a desired number of ticks once a down bar occurs, while the short position is just the opposite. 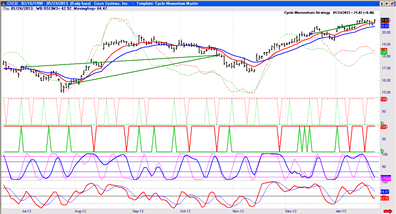 Trailing stops with a variable dollar amount are included with this strategy.